TMR was asked to participate in a study with A Major Difference, makers of the IonCleanse® footbath system for detoxification, to determine the effectiveness of the technology for treatment of the symptoms of autism. This is the results of that study. To access a printable copy of the study in Word, click here, or PDF, click here. The primary mission of TMR is to share their stories and inspire hope by spreading the message that biomedical and alternative interventions are effective in treating children with autism. 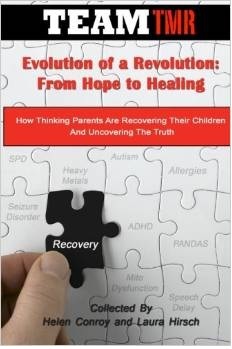 They believe that the current autism epidemic is a toxicity problem, which once addressed correctly can be reversed. Rejecting the opinion that autism is incurable, they believe that autism is treatable. After being introduced to A Major Difference, Inc., of Centennial, CO. AMD which manufactures the IonCleanse® Detoxification Footbath System, several TMR members used the machines with excellent results. This led to the idea to conduct a study on the efficacy of treatments using ionic detoxification footbath technology. Please note: AMD agreed to provide the IonCleanse® for use at no cost to the study participants. Study participants were able to purchase the IonCleanse® system at 60% discount at the conclusion of the study. Study participants were not required to change any of their treatment protocols before or during the study. AMD is a leading resource of toxin awareness and technology to cleanse and purify the body. More information is available through their website, www.amajordifference.com. The basic protocol specified the use of detox footbaths every other day, for a minimum of 15 minutes per session, over a period of four months from January through April 2015. A sample population of 28 children, with their families, volunteered to participate in the 2015 TMR study. Four participants opted out of the study within the first 30 days. There were several families who had more than one child enrolled. The active study was preceded by an evaluation survey conducted prior to initiating the footbath sessions. The evaluation was then repeated at the end of each one-month period. A total of 5 surveys per individual participant were completed over the four-month study period. The survey results were collected and compared. The data was statistically analyzed and displayed in a series of tables, graphs, and cumulative distribution curves, displayed later in this report. The survey format utilized is the “Autism Treatment Evaluation Checklist” (ATEC) developed by Bernard Rimland and Stephen M. Edelson of the Autism Research Institute, San Diego, CA. The ATEC is a highly regarded assessment tool for the evaluation of children diagnosed as being on the autism spectrum. The ATEC is specifically designed to measure treatment effectiveness. The ATEC is not a diagnostic checklist. It provides several subscale scores as well as a total score to be used for comparison at a later date. The lower the score, the fewer the problems. The ATEC is a one-page form designed to be completed by parents, teachers, therapists and other caretakers who have close observational experience with the subject. Many parents and teachers use the ATEC to monitor how well the child is doing over time. 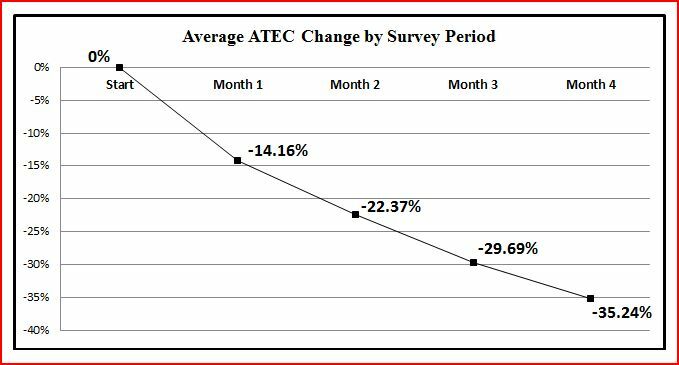 In addition, researchers have used the ATEC to document improvement following an intervention, by comparing the baseline ATEC scores with the post-treatment ATEC scores. Unlike most other tools, the ATEC is not copyrighted and may be used free of charge by any researcher. 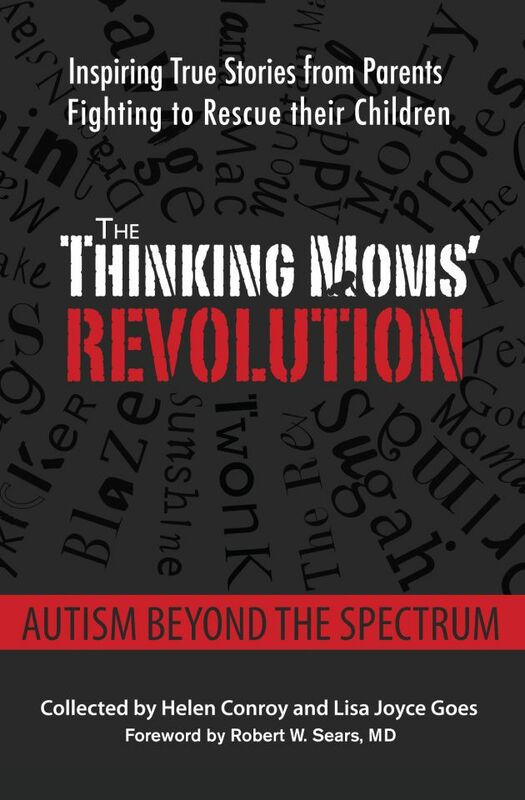 Copies are available on request from the Autism Research Institute or at the ARI web site, www.autism.com. Users of the ATEC may have it scored free of charge (4 subscores and a total score) by entering the responses via computer to the ATEC form on the website for immediate and free-of-cost scoring. ATEC forms are only accepted online. a. The data curves were smoothed but the choppy appearance is due to the low sample size. If the sample size had been larger, at 1000 or 10,000 data points, the plots would have been more evenly distributed, yielding symmetrical graph lines. b. Trend lines are not necessary or helpful in this chart. c. The direction of improvement is to the left. Lower scores = better results. d. The K-S line = the score where the widest dispersion (greatest improvement) exists between two data curves. a. The greatest initial improvement occurred at score 26, between the baseline and 30 day results. b. 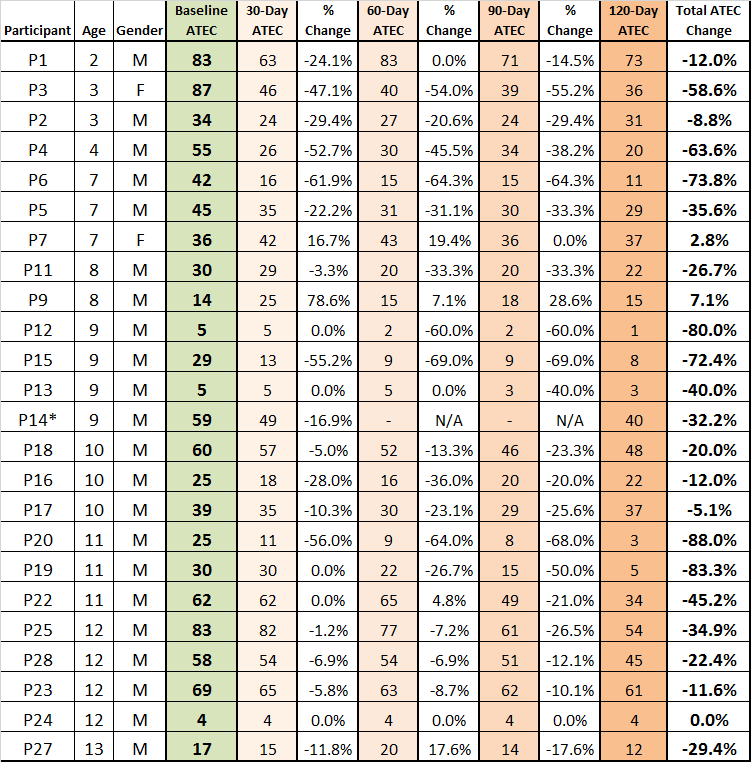 Improved scores continued, at a lesser rate of change, through the 60 and 90 day periods. c. The 120 day results were mixed within the same range as the previous 30 and 60 day data. a. Only 54% of participants were below the initial average score (41.5), at beginning of study. b. By end of study, 79% of participants were below the initial average score (41.5). The efficacy of treatments using ionic detoxification footbath technology has been validated through the TMR-ATEC Survey. Observed results, combined with mathematical analysis, have shown clearly that detoxification is an essential element in the autism recovery process. The cumulative distribution of survey scores (Figure 3) illustrates the progressive nature of this protocol. The chart shows the percentage of the sample (left axis) that has recorded a specific score (bottom axis). The five separate curves show the scores of the sample group at distinct time intervals (0, 30, 60, 90, and 120 days). The point of maximum scoring difference, between time intervals, was observed at score 26 between the baseline curve and the 30 day curve. This indicates the point of greatest improvement during the survey period. Note: “K-S” stands for the Kolmogorov–Smirnov test, which compares sample data with reference (baseline) data. 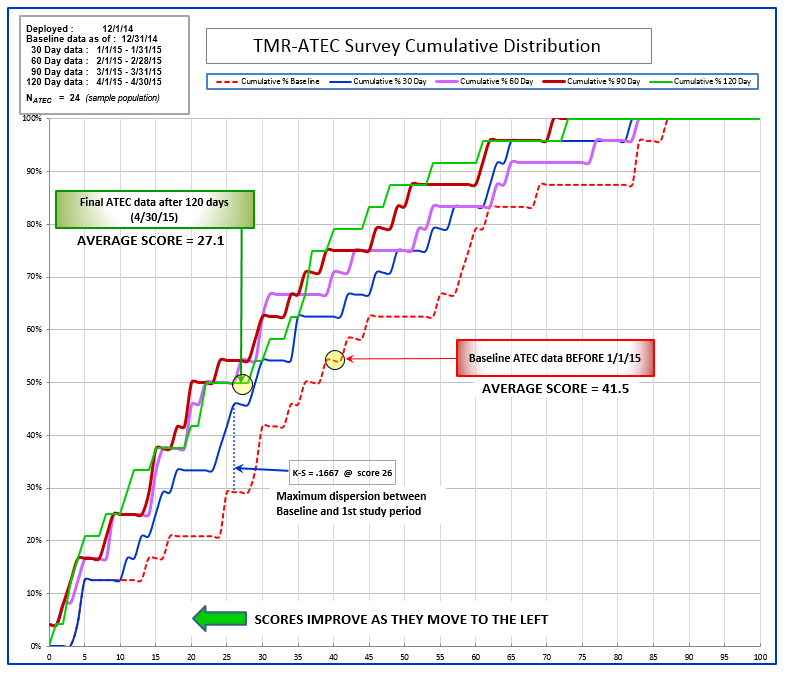 At the time of the baseline ATEC survey, the average score was 41.5, for the entire sample group. At conclusion of the survey (120 days), the average score for the entire sample group had decreased to 27.1. This indicates an overall improvement of 35%. The ATEC is specifically designed to measure treatment effectiveness. Lower scores indicate improvement of the individual participant. The chart shows that the study group, as a whole, obtained significant, positive benefit from the application of this technology. The curves moved steadily to the left during the survey period, indicating continual improvement of the group as a whole. These results establish high confidence that continued use of the IonCleanse® Detoxification Footbath System can be used as an effective tool in the treatment of Autism Spectrum Disorder (ASD). This entry was posted in Blogs by Thinking Moms' Revolution and tagged A Major Difference, AMD, IonCleanse, TMR study. Bookmark the permalink. The person above in the comments that kept insisting this shouldn’t be reported as positively as it is, that it’s not a true representation and all of the other nonsense is just a very negative person or someone who truly doesn’t want others to find healing. The comments were just beyond ridiculous. The study very clearly lays out what was done, all the parameters, the diagnostics, the follow up intervals, etc. To keep badgering someone about his ability to ascertain positive results and what those were related to in this situation is just beyond absurd. If you don’t want to believe it, then don’t. The only people you will be hurting on those you could benefit. Maybe you’ve been brainwashed by the media, big pharma, and the conventional medical cabal a little too long. I find that many people will only change a belief in the face of overwhelming “scientific” evidence, even when the “anecdotal” evidence is right in front of them screaming to be recognized. I find it very sad. In this case, there is no doubt that the IonCleanse did an amazing job for a lot of kids. To reject such a non-invasive technology because it hasn’t been tested in 20 double-blind placebo-controlled trials is just silly. How can it be a scam when the company has a 100% 60-day return policy for dissatisfaction? If it is not working, you just get your refund and send back your machine. We have high-functioning ASD in our family and our IC FB is working so well in the first week, it’s hard to believe. I keep pinching myself about how well the foot-soakers are doing. Life is already easier as a result. Can you please add my name to the Practioner Locator Listing as I will be referring my patients and any others to purchase the Ion Cleanse. Daniel and Daniel Optometry, Inc.
How many of the families in the study bought the ion cleanse? My 2 boys were in this study (P1 and P4). We’re continuing to have phenomenal results even after our part of the study concluded! I wanted to share that there is a Facebook group called IonCleanse by AMD for ASD (search inside of facebook) where tons of people are sharing their ongoing experiences. Really great testimonials and information in there! Yep, those limitations all exist. And that’s a great addition. Though, I think the “small and unrepresentative sample size” is not quite the limitation it may appear. I know the people involved, and it’s a pretty representative sample. In addition, the changes reported are so large that even with the smallish sample size, the null hypothesis (that the IonCleanse does not affect autism behavior) is extremely unlikely. How is it a representitive sample? What criteria are you using to conclude that? Yes the effect size is there, but you’re assuming the effect is due to the foot bath, which is not a valid assumption given the study design. You would need a control group to conclude that. The “criteria” I’m using is that I know the people involved in the study, and I know the autism spectrum. These children came from all over the autism spectrum and were both boys and girls. The only thing required for the study was an autism diagnosis. Children with seizure issues turned out to be bad candidates, but there were no other exclusion criteria. Yes, I am assuming the effect is due to the foot bath. YOU would need a control group to conclude that the effect was due to the foot bath. I, however, again, know the people involved, and there is no one intervention that created that much improvement in more than a handful of those children in the past. The results of this study were absolutely, positively stunning. Good friends of mine got more excited than I’ve ever seen them. There is no possibility this was due to the placebo effect. The only way the result could be NOT due to the study is if every single one of those parents had encountered and begun the most effective intervention in their children’s lives all at the same time at the start of this study. Didn’t happen. That may be true, but the paper includes no discussion of inclusion/exclusion criteria or how demographics were matched to make it representative. You can’t just claim it is without any evidence. As far as sample size goes, you can’t make that claim about the without providing significance analysis. Also, because this is not placebo controlled you can’t say it’s due to the IonCleanse rather than placebo. Lack of placebo controlls is a problem with the current study as well. It can’t be that hard to make a sham foot bath that just changes color or barring that, simply cover it so the child and parents don’t see what happens. It was not meant to be a study done according to stringent scientific criteria to be published in the New England Journal of Medicine. To do so would have been significantly more difficult and expensive. It was meant to be a first cut at seeing what the IonCleanse can really do for children with autism, and it succeeded in that regard in spades. *I* CAN say these results are due to the IonCleanse and not placebo because I KNOW the people involved. Each of the families had done a great deal of biomedical treatment beforehand, with varying degrees of success. Improvement such as happened during the course of this study could have occurred without the IonCleanse in one or two of the children, but certainly not across the board like this. Several of the children involved made incredible breakthroughs, like learning to speak at the age of 12, and finally being able to potty train. These are not results that come about by accident. It’s not hard at all to make a sham foot bath, but it’s a lot to ask of parents and children to take the chance of putting all this time into a sham protocol. I couldn’t do it, even for definitive scientific proof. I would want each and every child who participated to have a shot of getting results like these. How does knowing the people involved account for the placebo effect? How does knowing them rule out the possibility that parents were looking for improvements in their children (even subconsciously) on the subsequent ATEC tests? Wouldn’t it be better to give some sham foot baths in order to reliably determine if the effect is caused by the foot bath? Wouldn’t it be more ethical to reliably know that parents aren’t paying thousands of dollars for the illusion of a treatment? I know the people, and I know how they react to things. I’ve watched them react to OTHER interventions in the past, and they are ALWAYS looking for improvements but rarely finding more than a little improvement. TMR’s deadpan Brit took to writing status updates with 20 exclamation points. You don’t see that sort of thing and not KNOW you are dealing with something amazing. You don’t know me, so unless you’ve been reading our stuff for a long time, you can’t know that I tell the whole truth when it comes to interventions. I have repeatedly in the past said there is NO intervention that “works” (gets big results like these) for every child. And that is absolutely true, but if I were to suggest ONE intervention, with the exception of diet change (and there is no single diet that works well for everyone), this is the single best intervention I have seen. Hands down. It stands to reason because toxicity is the major problem we are dealing with. Having an easy reliable way to detoxify our kids’ bodies is a no-brainer. I have wanted one of the foot baths since they started the study, but my children do not have autism diagnoses and so we did not qualify. AFTER the study, I coveted a foot bath that much more because I know what a difference it made to my friends’ kids lives. A Major Difference came to us to do their study because they knew that, as a prominent group of autism moms with a reputation for integrity, if their devices were helpful for our children, we would get the word out. In hindsight, it was the smartest thing they could possibly have done. The group of parents involved in the study were well-known to each other and all good friends. 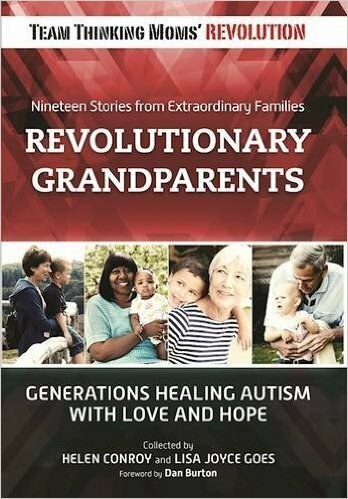 Imagine for a moment that the study participants were your family members, and they all needed a tremendous amount of healing to begin to function in the world. They all got approved for a promising new treatment that you’ve heard is saving lives. Would you be okay with only half of them getting the real thing while the other half didn’t, even though they might die if they don’t get it? It’s like that for us. These people are our extended family. Their kids are in dire need of effective interventions as the list of things they may never get to do grows day by day. You may think it’s more “ethical” to deny them treatment, but I cannot agree. My own family has been through a gamut of promising treatments for autism, so I understand your perspective. But these treatments turned out to be ineffective for us, despite many arguments similar to yours extolling their virtues, and in many cases have proven to be duds by the scientific evidence. The end result is that my parents are out many thousands of dollars for little benefit. If you’re going to promote a treatment to well meaning parents that costs thousands of dollars, you had better be damn sure that it works. NO ONE can claim with certainty, based on this study, that the foot bath works. To say otherwise is delusional, and is preying on the desperation of parents who want what’s best for their child. You didn’t ask US about those treatments. We would have told you — honestly — that in general most treatments that are considered the be-all and end-all help about a third of patients, don’t significantly affect another third, and often make things worse for another third, the main reason being that individuals have widely varying genetic and environmental exposure profiles, as well as significantly different attitudes toward treatment. No one can claim with certainty that using a foot bath will lessen any particular person’s autism symptoms based on ANY study anywhere (and I certainly would never do so), but knowing the particular people in THIS study very well (over the course of years), *I* can claim with certainty that the foot bath “worked” to lessen THESE children’s autism symptoms, and that it “works” to reduce overall toxic load levels in the body. I absolutely agree that if we are going to promote a treatment that costs thousands of dollars that we “had better be damned sure it works.” It is neither delusional, nor “preying on the desperation of parents” to say that for many children the IonCleanse foot bath will be an effective intervention. It is simply telling the truth as I, a person trained in science (Physics degree from the #1 college in the country according to Forbes) and with a highly logical mind (got an 800 on the logic section of the GRE and would have even it were considerably harder than it was), see it. And I’m not going to back off of it because you disagree. By the way, the one way in which the IonCleanse study participants may not have been “representative” is that their parents have for the most part been those who have been actively seeking solutions, including biomedical treatments, for years. For the most part, the children’s diets are probably cleaner than the average child with autism, and their guts may be healthier to begin with, which makes the results in many ways that much more remarkable. Many of the children’s parents either suspected or were convinced that further major improvements were unlikely. This is another exciting step in the right direction. I’d Love to see the testing results for adults with Autism. Thinking most of us can’t afford $2,000.00 to buy one to give it a whirl and see if it helps our sons and daughters. I would love to see that too, Jan. I’m thinking it would be great for groups to order. I know it’s a bit pricey for individuals who don’t KNOW if it will be helpful or not. I’ve been coveting one myself. Do you know if AMD is looking to do a second, larger study by chance? Or maybe just add on additional kids and their results to this first study? I really like the study but with so many kids being already fairly low on the ATEC (a 4??? I would KILL for a 4!!!) it might be nice to have a larger group of kids and their improvement data to analyze. Plus then we could play with the machine for a few months in the name of science! I like your thinking, Meghan. And AMD IS doing another study, but I THINK they may already have their study participants enrolled. Sorry! This is great news! I didn’t know that. I’d consider it on those terms. They recommend two 15-min sessions per day, but highly sensitive kids may require far less in the beginning. Would it have to be Ionic Cleanse or would a more affordable brand do just as well? The ASD adult in my house is having amazing gains in week 1. From debilitating mental dysfunction to stable, happy function. Much to celebrate.